Hera, the youngest daughter of a well-to-do rural family, is the wife of Zeus, a successful English businessman and aristocrat whom she has been living with for twenty-five years. Together they have raised five children, the youngest of whom, Hebe, is about to be married to a local railway tycoon, Heracles. Though on the surface their lives are blissful, it is revealed that Hera has been tolerating her husband’s frequent infidelities for over a decade, much to the chagrin of her elder sister, Hestia, who also lives with the family. Recently, signs that Zeus has been stepping out again have led Hestia to believe he’s dallying with Iris, a relatively new maid, but upon confronting her it becomes quickly evident that this is not the case. A massive rainstorm hits and threatens to ruin Hebe’s outdoor wedding but the family rallies and saves the day. During the festivities Hestia comes to realize that the footman, Ganymede, is in fact the object of Zeus’ affections, but is more startled to find out that Hera knows and tacitly approves- or at the very least, has agreed to cover the affair so as not to threaten the security of her home and children. When Hera refuses to divorce Zeus, Hestia abandons her sister and moves north to stay with their sister Demeter, also a previous conquest of Zeus. This play was my contribution to the first San Francisco Olympians Festival and I have to admit, I am incredibly proud of it. With this piece I accomplished so many things I had never done before, including write a three act play (and keep it interesting), write a play focused on two middle-aged women, successfully sustain a historical setting and vernacular for an entire full-length, and write a sympathetic representation of a viewpoint I don’t entirely agree with. The last was, for me, particularly poignant, because I tend to very much create work that ties in with my value system, and so writing a play about a woman who chooses not to live passionately but rather to live well, who continues to love a man who isn’t passionately in love with her, and whose silence is ultimately her greatest strength was a bit of a philosophical stretch. Not to mention the sheer strangeness of me, a gay writer, in the midst of a nationwide debate over gay marriage, writing a play about a willful and relatively happy beard. But my goal with this show was to create a new way of looking at a much maligned figure- the Greek goddess Hera- and with that new perspective also present a stronger, more empowered version of the archetype of the wife of the gay man- a common figure in queer theater, usually either a victim or an object of ridicule. I also wanted to explore marriage as a concept and an ideal and how that differed from romantic love, and especially our ideals of romantic love. In this regards, the supporting characters of Heracles and Hebe came in particularly handy, and one thing I really love about the play is how the preparations and antics surrounding their marriage provides not only the bulk of the play’s comic relief, but secretly wins the audience over to Hera, who is an infinitely more self-possessed and powerful woman than her charmingly neurotic daughter who, despite a certain willfulness on the surface, is never-the-less happy to resign herself to a frivolous life with a sweet dullard of a husband. Though we never actually see Zeus in the play, he’s discussed so constantly that we’re able to walk away with a picture of him and that portrait is of a very dynamic man. In the end, this play is about how loving dynamic people often results in a great deal of trouble, a certain understanding that they will probably never belong completely to anyone but themselves, and a relationship that will have to entail far more than the conventional. And in this sense I suppose the play is actually very much in line with my value system. 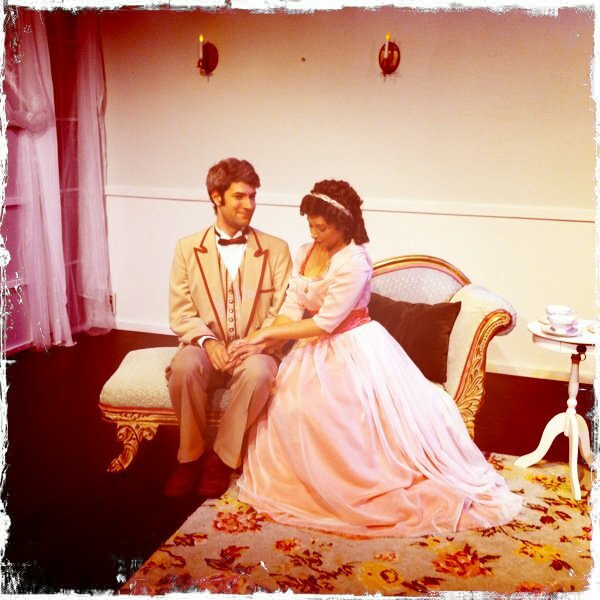 Bryce Duzan and Katrina Bushnell in the Wily West production.